Maine...famous for its quaint towns, romantic islands and rugged coast. The summer months are filled with beachcombing, boat rides and lobster bakes. Windows are always open, floors usually sandy, and swimming towels take up residency on porch rails as they dry in the summer breeze. We all wish it was endless. Dipping temperatures, often in the negative, snow storms, ice storms and as the thaw rolls through; mud season. We all wish it would end. The bag collection was designed with all 4 seasons in mind - to create a chic yet rugged piece that could withstand the elements and still remain beautiful. Waxed canvas creates a water repellent bottom, pebbled leather always looks naturally weathered and brass hardware adds strength, function and glimmer. Summer linens are often printed with fun designs or stand on their own. An ever evolving collection made to last the test of time. Tori T Yattaw was raised in Midcoast Maine. "I have always been surrounded by the fishing industry. My Dad owned a scallop dragger, many friends are lobstermen and my husband was a ground fisherman. It has always been a part of my life and has definitely influenced my designs. I always add a touch of nautical whether it is the brass hardware, rope or waxed canvas. It is important to me that those subtle influences be included." With a Degree in Accounting, but a passion for art, her creativity started with oil paintings. Working for years as Controller/HR Manager in a manufacturing facility, she needed an outlet from a demanding job and creating handbags organically transpired. A primarily self taught artist and very limited sewing knowledge, she taught herself the skills needed to screen print and sew leather. 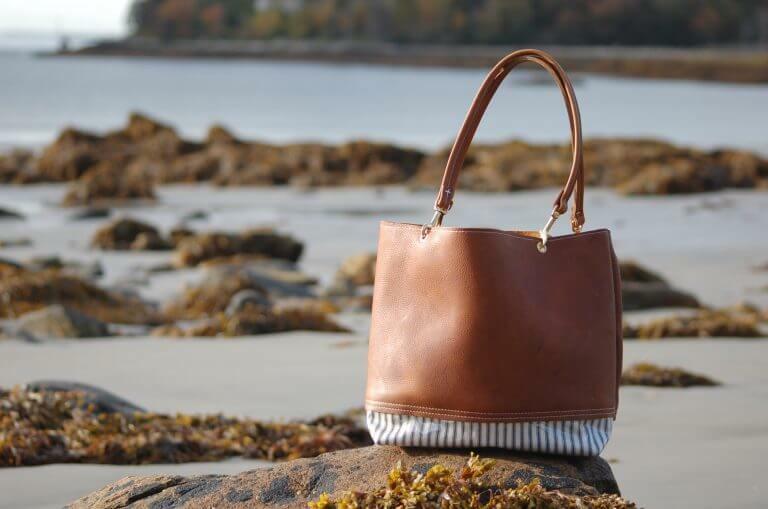 All bags are handmade in her studio overlooking a small pond in Maine.